Last Thursday Cape Town achieved a major milestone in the democratisation of this city with the launch of Transport for Cape Town, the city’s new integrated transport management agency. At the launch, the Dean of the Faculty of Engineering and the Built Environment at the University of Cape Town (UCT), Professor Francis Petersen, announced a partnership between the University and the City of Cape Town (CoCT) to examine the future of the incomplete foreshore freeways. On the face of it this is good news; the future of the Foreshore Freeways has been hanging in the air – much like the freeways themselves – ever since the full elevated city ring road concept was abandoned in the 1960s (largely due to lack of funding rather than a damascene change of heart by the city authorities or rumours of shopkeeper resistance). A partnership between the CoCT and UCT will harness some of the brightest young students in Cape Town to develop an international design brief for proposals to complete the unmade sections of the freeways, creating a project that could be a centrepiece of Cape Town’s status as World Design Capital 2014 (WDC2014). But before we start slapping ourselves on the backs and popping champagne corks, closer examination of the details in this proposal leave room for some considerable concern. Principle amongst these is the implicit assumption in the proposal as currently drafted, that completing the foreshore freeways would be a Good Thing To Do. But on what basis is this assumption made? Has sufficient (or any) work been done to determine this? And why are the terms of reference so narrowly drawn? This rather suggests that a decision has already been made that the freeways should be completed, and the role of the students is simply to find the best (engineering) solution for their completion. Which brings me to a second concern. UCT’s Faculty of Engineering and the Built Environment (EBE) is overwhelmingly an engineering establishment. The vast majority of the student body, teaching staff and leadership are engineers. Don’t get me wrong – I have no issue with engineers. Some of my best friends are engineers (maybe). But this a question of approach. At the core of the Engineers approach is to ask: How? And when that is the right question to ask, then engineers are the right people to be asking it. But I’m not convinced that it is the right question, at least not yet, and not on its own. But the EBE faculty also includes the School of Architecture, Planning & Geomatics. At least nominally it does. Sadly, the interaction between staff and students in this school and the rest of the faculty is minimal. And with a total complement of only a few hundred students, the influence of this school on the rest of the faculty is equally slim. Yet it is the approach of architects, planners and urban designers that is needed here – an approach that asks: Why? Who for? Who benefits? How do we create the optimum benefit? But from the way in which the proposal is written, the School of AP&G is unlikely to get a look in on this one. “to review and consider existing proposed conceptual design reports of the incomplete sections of the Foreshore Freeway and to draft innovative design proposals for the incomplete sections of the Foreshore Freeway taking into account its importance and critical function not only in improving access to the City, but also improving living and working conditions for people in the CBD and surrounds”. Surely such a study needs to begin with an open and honest appraisal of transport needs – in terms of individual drivers versus those using public transport; the need for strategic versus local connectivity; the requirements of wheeled transport versus those of the pedestrian; and the requirements of transport in general versus the quality of the streetscape and public realm? And even from a vehicular transportation point of view, surely it needs to consider how effective the completion of the freeways would be? It has been demonstrated in transport and urban planning studies in the UK and USA that creating more road space does not alleviate congestion, at least not for long – instead it increases demand leading to equal congestion only by more vehicles (with consequent increased carbon emissions, worse pollution, etc.). Increasing vehicle capacity for private vehicles also undermines the viability of public transport – to do this at precisely the time that Cape Town is introducing one of the best public transport systems in the country is simply madness! Consider too, that the worst congestion is not actually in and around the CBD. What is the point in increasing capacity on the Foreshore if bottlenecks remain at Hospital Bend (the N2/M3 junction), on the M5, at Vanguard Drive, and etc.? In cities the world over, elevated ring roads are coming down (see Madrid Rio Park, or Boston’s Big Dig); road space is being re-prioritised in favour of the pedestrian, cyclist and public transport; redundant transport infrastructure is being reinvented as public parks and open space (as at New York City’s High Line); and citizens are rediscovering the joys and benefits of inhabiting rather than simply moving through the spaces of our cities. Now is not the time to be revisiting and completing a relic of apartheid and modernist utopian planning, at least not without an overwhelming body of evidence that demonstrates the necessity for it. What this research proposal requires are bold ideas, uncluttered thinking and innovation. There is little in the existing TOR that suggests we will get much of that: and a great opportunity for remaking this city to serve the majority of its citizens will be lost for another couple of generations. If the EBE Dean could bring himself to drop in on the Centlivres building, and spend some time with my 3rd year architectural students – he would find a ready made laboratory of ideas for the future of the Foreshore Freeways; from parks and urban farming, to skate-board and cycling highways … And that’s before he’s spent time with the many other talented architectural, planning, landscape architectural and urban design students in the building. Most importantly, the realisation of any proposals that come out of this process shouldn’t burden the city with an albatross around its neck, cutting off the city from the harbour and waterfront – and creating a massive headache for future generations: consider the lesson of Boston, which has spent billions of dollars over the last 10 to 15 years taking down their existing inner city elevated freeway system and burying it underground. I’m not suggesting that’s the right solution for Cape Town, but if it is it would be far simpler to do it now while there is still relatively little development in, around and under the freeways, than it would be in future. Guy Briggs is principal of GB|USPD, an urban design consultancy based in Cape Town. He is an Academician of the Academy of Urbanism (UK), a Fellow of the Royal Society of Arts (UK), a member of the V&A Waterfront Design review committee, and Cape Town city representative for the global Council for Tall Buildings and Urban Habitat. Guy teaches at UCT School of Architecture & Planning, and is currently working with Wits University to establish a research network – City-form Africa – focussed on urbanisation and sustainability in sub-Saharan Africa. Prior to returning to South Africa from London in 2010, he was urban design director at international consultancy EDAW|AECOM, and co-Chair of the Bristol Urban Design Forum. All the articles I’ve read about this, likely to have been drawn from one press release, imply that the unfinished freeways WILL be completed. I was immediately concerned, as my personal view is that the whole thing should come down, never mind the unfinished “eyesores”. Brett Herron tweeted that it will not necessarily be to complete them, but to look at options. Still, I get the sense that some people feel that “completing” the freeways is an option, which is absurd. This really should be a more transparent process, at least opening up briefs to the public and other institutions. After reading this post and seeing that there is more of an engineering focus and a lack of transparency even within the EBE faculty, I’m even more skeptical. We really should call for briefs to be made public, and allow people to submit proposals, even if just for fun. Given the significance of the site in the city, all citizens should have a say in this. The process so far hints at the control and opacity of the Foreshore’s construction in the 40s and 50s. Great article. It would be great if Prof Peterson could be sent the link to this page so we could see from his side how the faculty plans to approach this project. On the issue of the minimal interaction with staff and students in the faculty I couldn’t agree more. I did a three year Property Studies degree (which is part of the EBE faculty) and not once did any of our projects involve interaction with architecture, planning or engineering students (and only minimal interaction with Construction Studies). Learning how to work with professionals from other fields is key to approaching a project like this (and in life generally), and it’s especially disappointing considering the architectural and engineering components of the projects we had to do. Then on the issue of public participation, what does the city think of all this (and by city I mean the people of Cape Town)? 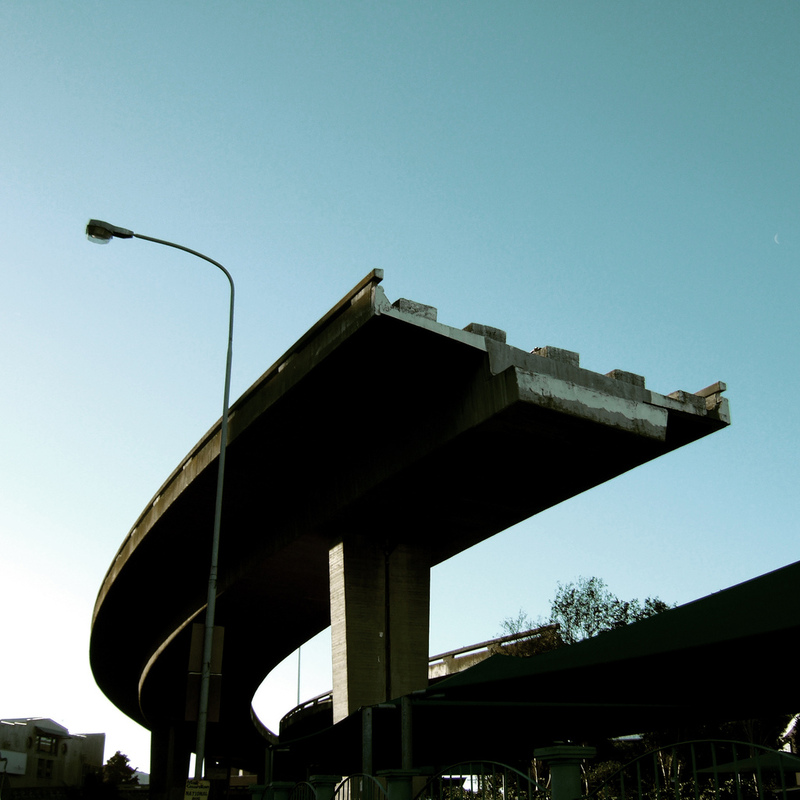 How many people actually want the freeways completed, and how many rather like the idiosyncratic nature of the unfinished freeways and would rather like a design that emphasises this peculiar urban symbol of Cape Town? Will people be in the city be told exactly how many minutes completing the freeway will shave off travel time from the freeway to Greenpoint etc? People need to be kept informed throughout the process so that we can have a say on the cost vs. benefit of completing the freeways. If it’ll take a billion rand to shave 5 mins off the travel time of 3 000 people for instance, then maybe the unfinished portions of the freeway should rather be used for something else other than ‘road’ space – like a museum, elevated park, etc. The point is all the options should be considered, and presented to the public, rather than us finding out in the newspaper next year that a decision’s already been made and we’re going to have something we don’t need, or even worse, don’t want. Public participation is extremely important in a participatory democracy like ours, and the City Council should use the opportunity of Design 2014 to think of innovative ways of presenting the various options to the public so they can actually see what we think (such using crowd-sourcing techniques like the NameYourHood campaign as just one example). This is unfortunately a complete misconception of the involvement of UCT in the project, and was sent out prior to finalising the jointly agreed on brief. EBE students will be considering the future of the north foreshore area, and all possible options for turning this into an exciting and lively part of the city. They will consider how it might be possible to reconnect the centre with the sea, and how to bring housing and markets into the area. This will be a series of student projects involving architects, planners, landscape architects, urban designers, civil and chemical engineering students and construction economics students. Students will be encouraged to think creatively about our long term future – involving issues of climate change, resource depletion and sustainability requirements. The stumps of the freeway might make good locations for markets or viewing platforms. The interdisciplinary and problem-focussed nature of the project will be a huge learning experience for all the students involved.